This week's episode of American Horror Story: Asylum brought back Frances Conroy in a dark and truly fantastic role. In a couple of weeks, we'll see another returning actor from Season 1 make their (official) return to the series. Dylan McDermott tweeted a photo of himself on the show and it's very creepy. Spoilers ahead! If you don't want to know who he's playing, read no further! We know who the Bloody Face of the past is, but who's the man behind the mask in the present day? Who ripped off Adam Levine's arm and strung up those copy-cat guys? That would be Dylan McDermott's character. This was confirmed by Ryan Murphy to Entertainment Weekly after fans speculated that the voice on the phone in the November 21 episode ("The Origins of Monstrosity") sounded like McDermott's. Sure enough, it is. 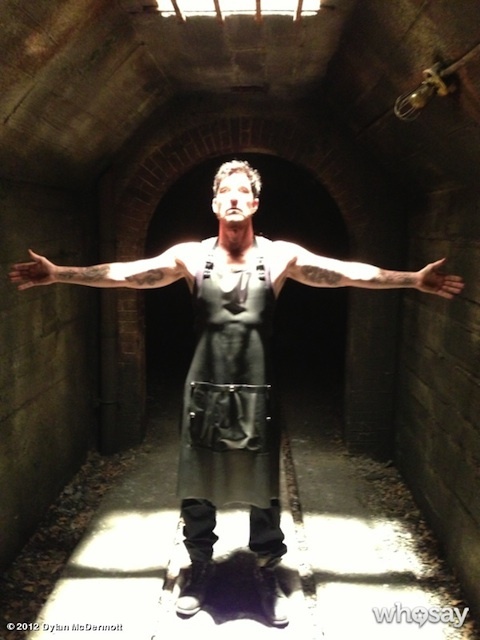 McDermott tweeted the following creepy photo of himself in the tunnel, tattooed arms outstretched. The photo was posted over the caption: "I AM THE MODERN DAY BLOODY FACE!". Is he surrendering? Or is this some kind of nod to Jesus? Religion certainly has played its role in the series. From what Murphy says, we'll find out what he's doing in Episode 9, creepily titled "The Coat Hanger." That's currently scheduled to air December 12. While he was a good guy (relatively speaking) in the first season, I'm thinking we'll be seeing the darker side of McDermott this time around. Can't wait! American Horror Story: Asylum airs Wednesdays at 10:00 p.m. ET on FX.